MISSION, KS--(Marketwired - Oct 10, 2013) - (Family Features) Craft, cook or scare up some truly creative treats and decorations this Halloween. New glow-in-the-dark paints and trendy glow sticks have made setting a scary mood simple. So, get started creating the right look for your home -- inside and out. Whether you love creating a little glitz and glamour or something frightening and fun, the experts at the Jo-Ann Fabric and Craft Stores have come with ideas and inspirations for making this Halloween your best one yet. Frightful Fun: Lead trick-or-treaters to their doom or, at least, your front door by lining the sidewalks with glowing rocks. Paint smooth river rocks with glow-in-the-dark spray paint. Once dry, use black paint and a brush to write scary words or draw silly designs on the rocks. Decorate Your Heart Out: Use black glass paint to turn a thrift store cake stand into a pedestal for your scariest Halloween decorations. Pile plastic hearts or skulls in the middle and cover with a clear glass cloche. Decorated cupcakes or a cakepop display would also work well under glass. 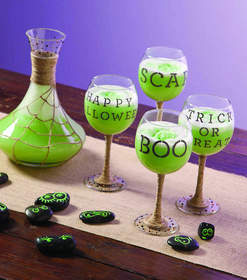 Eat, Drink and be Scary: Scary food ideas abound, but few drinks scream Halloween more than an embellished decanter of swampy green brew or blood red punch. Before pouring the brew into fun glassware, drop plastic spider rings inside ice cube trays, fill with bottled water and freeze. Your guests will love a few frozen creepy crawlies in their drink. Making your own embellished decanter and glassware is a simple project for crafters at every level. The best part is you can get the whole family involved. For more holiday décor inspiration and craft projects, visit www.JoAnn.com. 1. Adhere stencils to wine glass in design of choice. 2. Using a sponge pouncer, paint in the stencil. Remove adhesive stencil while still wet, and then allow glass to dry. 3. Wrap stem of wine glass in jute. Start by adding a small amount of glue at the top of the stem to secure the jute in place. Tuck the raw end of jute into wrap as the stem is circled. Wrap to the base of wine glass. Add a small amount of glue at the end to secure. 4. Embellish the base of the wine glass with self-adhesive rhinestones. 1. Using a hot glue gun, stabilize 4 pieces of jute to the bottom of the decanter. Design a spider web pattern up the decanter using jute. Each horizontal piece of the spider web is individually cut and glued in place. 2. Horizontally wrap jute around the decanter to hide the raw edges of jute created by the spider web. Use glue at the start and finish to hold in place. 3. Embellish decanter with self-adhesive rhinestones.